I think the cardboard trays are a good idea, but I noticed before that your fruit juice nearly ran into your sandwich! It must be really difficult to keep it all separate! Where's the veg in this lunch? Wow, Ian, that's a great reduction in trash! What a grand idea to compost as well. I also see a need for each student to bring their own utensils with them to school. I've been doing it myself for a few years now at work and really appreciate being able to put less waste into the system. A kitchen at school, but no dishwasher for some plastic plates? 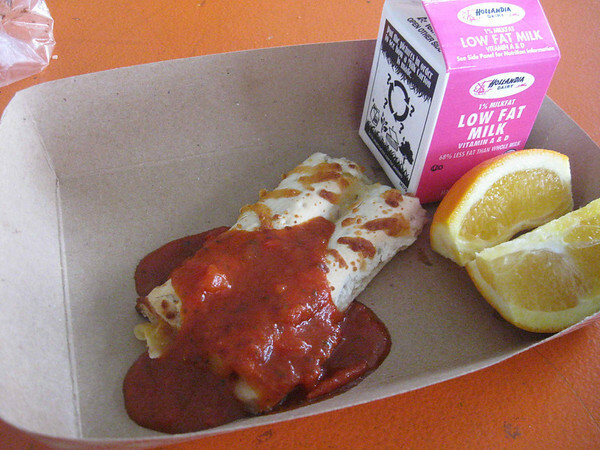 And two pizzasticks with mozzarella and marinara sauce, two pieces of orange and some milk as a school lunch? Or form-pressed chopped chicken leftovers, prefried and reheated, served with canned fruits.. in California, where fresh vegetables and fruits should be available all the year.. Guess You could do Your kid a favour and resettle to India.. considering the posts from India here in this blog his chance to get some good healthy food would improve there a lot. Ian only got to eat lunch at school for one week since I completely agree that the food should be way way better. He brings lunch from home everyday, but many kids aren't so lucky. Those looks like it taste good, but as for the nutritional value, I think overall the lunch is still lacking..
My kids get these same mozzarella cheese sticks but only as a side item with soup. I am surprised that they are being served as an entree at your school. This is a very skimpy lunch! Thanks for the explanation of the carboard boats. Why not just have paper dinner plates with divided sections? I would find it frustrating and unappetizing to have my foods run together every day. It's good the school got rid of the styrofoam trays though. I was about to bring up the same point. Why not have sectioned plates made out of cardboard? Or maybe a smaller boat for the fruit so that the syrup doesn't run into the other courses. I am sure the kids eat quite fast and this isn't a big issue, but it would be unappetizing if the cardboard get soggy because of the syrup and sauce. Hurrah! Some REAL FRESH fruit! But a quarter of an orange, surely is a mean portion of fruit and vegetables! Where are the veg anyway? I understand a bit better about the cardboard boat instead of the plastic in relation to pollution and I totally agree on the principle. However, being a French national, to me a meal served in what frankly looks like a trough, is total heresy! The trough should be at least shaped for every course so that the sugary juices of the ever recurring canned fruit do not spoil the savoury main course. Mom, keep fighting! Good food feeds good mind! It's great that your mum has been advocating for changes to the lunch arrangement at your school - she sounds pretty awesome! And recyclable cardboard is definitely a step forward from styrofoam. Maybe in the long run your school can get real plates, which would be even better. in the meantime I really like the idea of everyone bringing in their own plate - or maybe they could let you have a small recyclable cup for the fruit, to keep the juice away from the main course? Because I still think that looks a bit icky.